Well, the seasons have officially changed! The sun is coming up later each day, and although it isn’t cold yet, there is a chill in the air in the morning and evening. In the garden, the vegetables are ripening quickly and although not all our crops were a success, we have more than enough fruit and vegetables to be dealing with. We’ve made about 40 jars of tomato passata, ready to be used in sauces and curries until next summer, and lots of plum jam. In the dehydrator, we’ve had apples and plums drying ready to be snacked upon by hungry children. Still to be done is some jars of pickled garlic, and possibly a little more jam. On Sunday I tackled the pickled cucumbers. They are a favourite around these parts, and there was not a single jar left in the pantry – a dire situation indeed. Our cucumber crop was pretty dismal this year, and I wasn’t sure that we were going to be able to make any pickles at all. I was contemplating buying some cucumbers to alleviate our pickle shortage, but on Saturday, CB bought in a couple of kilograms of cucumbers in from the garden and I knew what my weekend job would be. 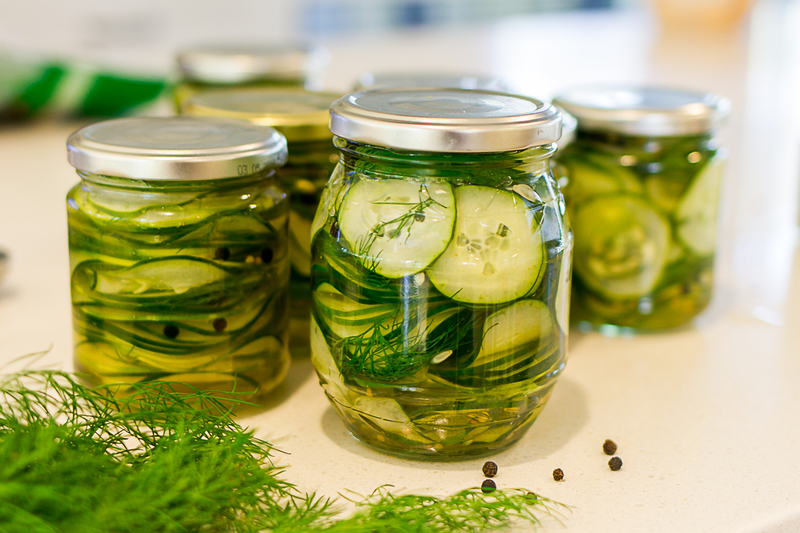 So on Sunday afternoon, with the help of our small chap, we made pickled cucumbers. A perfect way to spend a Sunday afternoon. The closest thing I can liken these to is the pickles at Mcdonalds, except these ones are a million times more delicious. They are crisp on the edges and sweet, salty, and sour all at once. I often have them on crackers with cheese, or on a sambo with leftover roast meat – delicious. Thinly slice the cucumbers - I use a mandoline slicer to get them super thin. In a saucepan combine the salt, vinegar, water, sugar, cayenne pepper, and mustard seeds. Bring to the boil and stir to allow the sugar and salt to dissolve. Pack the cucumber into sterilised jars. Layer pinches of dill fronds and peppercorns throughout the cucumber. Make sure you pack the cucumber in quite firmly. Pour the hot vinegar mixture slowly into the jar, allowing the mixture to seep in between the layers. Tap the jars to help any air bubble escape. Place the lid on the jar while the mixture is still hot, and allow to cool. Sealing the mixture while hot is very important to preserve the pickles. Sit the pickles on a shelf for at least a week before opening to allow the flavours to infuse. This quantity made us eight smallish jars – not enough for an entire year, but a good start. Fingers crossed we get a few more cucumbers off the plant before the frosts hit, so I can make enough pickles to last us until next year. If you want some hints on how to effectively clean and sterilise jars, check out this post of mine. There are lots of other preserving recipes found hereP as well. Hi Jo, would this work for grins. All the best,Jim. I should read gurkins. Sorry Jo. Auto spelling. 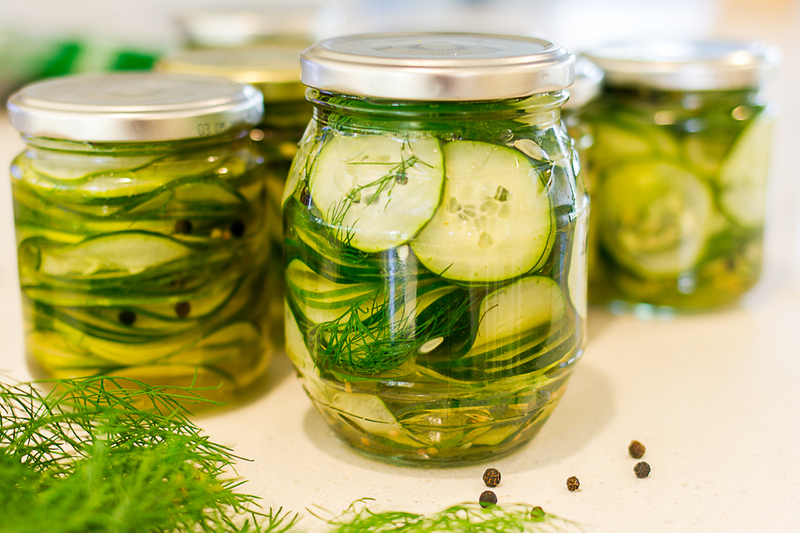 yes – gherkins are really just small whole pickled cucumbers. A nice easy recipe here! Do these keep for a while I the pantry or fridge? Unfort we didn’t get lots of cucumbers like last year but I’ll file this one away.